Background: The traditional use of Drimys brasiliensis Miers (Winteraceae) in the south of Brazil to reduce cholesterol has not been described in scientific literature. Objective: To verify the hypocholesterolemic effects of D. brasiliensis using rats as animal model. Materials and Methods: The bark of D. brasiliensis was extracted with water with further lyophilization and was subjected to phytochemical analysis by high-performance liquid chromatography (HPLC), and free radical scavenging activities by 1,1-diphenyl-2-picrylhydrazyl (DPPH) assay to determine antioxidant potential. The hypocholesterolemic activity was determined in male Wistar rats treated with 100 and 250 mg/kg/day extract concomitantly fed a hypercaloric diet, over 20 days (prevention assay). In the treatment assay, rats were fed a hypercaloric diet for 40 days and received the extract (100 mg/kg/day) from day 20. Results: In this research, we found that the extract of the bark of D. brasiliensis was able to reduce the triglycerides significantly and reduce total cholesterol at doses 100 and 250 mg/kg/day and both administration regimens (prevention and treatment) in rats treated with the extract and hypercaloric diet. The extract showed strong antioxidant properties (DPPH assay), probably responsible by hypocholesterolemic activity of the plant. By HPLC, we detected catechin (1.34%), epicatechin (3.48%), rutin (0.86%), caffeic acid (0.45%), and ferulic acid (0.84%) in D. brasiliensis extract. Conclusions: We confirm the popular use of the plant to reduce of cholesterol. Abbreviations used: HPLC: High-performance liquid chromatography; PDA: Photodiode array detector; RS: Reference substances; DPPH: 1,1-diphenyl-2-picrylhydrazyl; VCEAC: Vitamin C equivalent antioxidant capacity. The plant can be used to cholesterol reduction. Cardiovascular diseases are a major public health concern worldwide and are the main cause of mortality with high treatment costs. These diseases can lead to myocardial infarction and atherosclerosis, which are directly associated with high serum cholesterol. Hypercholesterolemia can be prevented by a healthy diet, physical exercise, reduction of alcohol consumption and smoking, and through the use of medicinal plants in health care and diet. The use of medicinal plants in health care is as old as human civilization. Plants and its chemical derivatives represent an important approach to treat and/or prevent diseases  and are a potential source for the discovery of new drugs. The plant Drimys brasiliensis is traditionally known in Brazil as “casca d'anta.” The bark and leaves are popularly used as a stimulant, an antispasmodic, aromatic, antidiarrheal, antipyretic, against uterine bleeding, and in disorders of the digestive tract. Volatile compounds from the bark of D. brasiliensis (200 mg/kg) showed antiedematogenic and anti-inflammatory properties.D. brasiliensis extract also showed antifungal properties, and isolated compounds showed analgesic properties., Other species (Drimys winteri J.R. Forst and G. Forst [syn. : Drimys granatensis Mutis ex L. f.]) are used as a tonic for weakness, and Drimys angustifolia showed antiulcer activity. Despite these widespread uses of the bark, current literature lacks studies on the pharmacology and chemistry of D. brasiliensis. The empirical trajectory of the use of plants is the first step toward the development of research on possible pharmacological activities. In Tupanci do Sul (population of 1573, a city in the south of Brazil),D. brasiliensis is used for cholesterol-lowering purposes, but despite this traditional use, there is no scientific evidence to support its cholesterol-lowering properties thus far. In the last century, Tupanci do Sul has been inhabited by indigenous people, contributing to some of the knowledge. Thus, this study aimed to determine the hypocholesterolemic potential of D. brasiliensis extract through a preclinical study in rats subjected to a hypercaloric diet and treated with the extract. In addition, the presence of some phytochemical compounds of interest was investigated, and the antioxidant potential was evaluated in vitro. The stem bark of D. brasiliensis was collected in September 2012, in the city of Lagoa Vermelha/RS/Brazil (Latitude: 28°12´39´´S, Longitude: 51°31´34´´W). A specimen was deposited in the Herbarium of the Institute of Biological Sciences UPF, Passo Fundo/RS/Brazil, under registration number 12748. The bark was washed and dried in an air-circulating oven (MAO 35/5, Marconi®) at 35°C for 3 days. Material was subjected to turbo-extraction with Type 1 water (Direct-Q, Millipore®), sieved to remove the coarse material, and subjected to rotary evaporator (B-490, Buchi®). The soft extract obtained was frozen and lyophilized (Interprise K2504, Terroni®) to obtain a dry extract, which was stored in sterile flasks at −20°C. Chemical analyses were performed by high-performance liquid chromatography (HPLC), Flexar LC Perkin Elmer® (Burnsville, MN, USA) equipped with a binary pump, photodiode array detector at 282 nm, and autosampler with a 20-μL loop, where peak areas were integrated into Chromera Software. A Brownlee C18 column (250 mm × 4.6 mm, 5 μm) was used. In the experiments, Type 1 water, acetonitrile, and methanol (HPLC grade) and phosphoric acid (analytical grade) were used. The reference substances (RSs) used were purchased from Sigma-Aldrich® with purity > 97%. The rutin, catechin, epicatechin, vanillic acid, ferulic acid, p-coumaric acid, and caffeic acid RS were prepared at a concentration of 120.0 μg/mL by dissolving in methanol. The mobile phase for the three first substances consisted of acetonitrile and water (pH 3.0) (18:82, v/v) (validated previously), and for phenolic acids, the mobile phase consisted of acetonitrile and water (pH 3.4) (25:75, v/v) (validated previously) and eluted at a 1.0 mL/min flow rate. The extract was prepared at a concentration of 10.0 mg/mL dissolved in methanol and filtered through a nylon membrane (pore diameter of 0.45 μm). The injections were made in triplicate. 1,1-diphenyl-2-picrylhydrazyl (DPPH, obtained from Sigma-Aldrich®) scavenging activity was determined using a method  modified by Kim et al. DPPH (0.1 mM) was prepared in 80% aqueous methanol. D. brasiliensis extracts were prepared at concentrations ranging from 100 to 500 μg/mL by diluting in 80% methanol. An aliquot (0.1 mL) of the extract solutions was added to 2.9 mL of the methanolic DPPH solution. The mixture was shaken and allowed to stand at 23°C in the dark for 30 min. The decrease in absorbance of the resulting solution was monitored at 517 nm (Lambda 20/Perkin Elmer spectrophotometer). The control consisted of 0.1 mL of 80% methanol and 2.9 mL of DPPH solution. A calibration equation was obtained with Vitamin C (20–100 μg/mL) with the addition of DPPH. The DPPH radical scavenging activity of the extract was expressed as μg/mL of Vitamin C equivalent antioxidant capacity (VCEAC) in 30 min reaction time calculated using the calibration equation of Vitamin C.
In vivo experiments were performed using thirty male Wistar rats with initial mean weights of 333.75 ± 32.97 g, which were divided into five groups with six animals per group [Table 1]. They were housed in individual plastic cages with a light–dark cycle of 12 h.
All groups received a hypercaloric diet prepared with 8% pork lard, 2.5% corn oil, 0.3% cholesterol (Sigma Aldrich®), and agar solution (0.9% w/v) added to commercial ration. Food and water were provided ad libitum throughout the experimental period. Treatments were administered by gavage. D. brasiliensis extract was suspended in distilled water at recommended doses at the time of administration. In the prevention assay, the extract (100 and 250 mg/kg/day) was administered concomitantly with the hypercaloric diet for 20 days. In the treatment assay, the hypercaloric diet was provided for 40 days, and the extract (100 mg/kg/day) was administered for 20 days starting from day 20 of the hypercaloric diet. All experiments were conducted in accordance with ethical standards for animal experiments; principles internationally accepted for laboratory animal use; and the Brazilian rules., The study was approved by the Ethics Committee on Animal Use in research at the University of Passo Fundo (protocol number 033/2012). Animal's food intake and clinical symptoms were monitored daily, and body weight gain was checked every 7 days. At the beginning of the experiment (day 0), the mass of the animals was considered equal to 100%. The relative weight gain was calculated relative to the initial weight (day 0). The calculation of the relative food consumption took into account the weight of the animal. After the experimental period, on day 20 (for GH, GDbP 100 mg and GDbP 250 mg) and day 40 (100 mg for GHT and GDbT), animals were fasted for 12 h, sedated with isoflurane inhalant, and anesthetized with 2% xylazine (0.5 mL/kg) and 10% ketamine (0.9 mL/kg) intraperitoneally. Anesthesia was confirmed by the lack of reflection of the lower limbs. Blood collection was performed by cardiac puncture using a heparinized syringe, and rats were sacrificed by exsanguination. Rats were submitted to laparotomy, organs were removed (lungs, liver, spleen, kidneys, and heart), washed with saline to remove blood, dried with filter paper, and weighed. The weights of the organs were normalized to the mass of the rat on the day of sacrifice. Protein quantification in the organs was performed by the Lowry method. Measurements of total cholesterol, High-density lipoprotein (HDL)-cholesterol, triglycerides, and glucose in plasma were performed using 350 BTS BioSystem® (Spain) dosing equipment using enzymatic kits (Labtest®, Minas Gerais, Brazil) according to manufacturer's recommendations. The blood of the animals was sent to the Clinical Laboratory School of the University of Passo Fundo for hematological analysis using the impedance method (Diagon®, D-Cell 60, EU). The results were submitted for descriptive and inferential statistical analysis. The pattern of distribution of data was analyzed by Kolmogorov–Smirnov test. The results were subjected to the comparison of means by analysis of variance (One-Way ANOVA for parametric data) followed by Dunn's post hoc test, with a significance level of P < 0.05. The results of body weight gain and food intake were evaluated through the analysis of two-way ANOVA for repeated measures. Data were expressed as a mean ± standard deviation. HPLC analysis of D. brasiliensis extract (10 mg/mL) detected some interesting substances. The amounts of catechin, epicatechin, and rutin were calculated from the integrated peak areas of the extract, as 134.20 μg/mL (1.34%), 348.26 μg/mL (3.48%), and 85.98 μg/mL (0.86%), respectively [Figure 1]. Caffeic and ferulic acids were found in the extract at concentrations of 45.36 μg/mL (0.45%) and 83.67 μg/mL (0.84%), respectively [Figure 2]. The anti-inflammatory effect of thirty flavonoids was evaluated, and among them, rutin and jaceosidina exhibited the best anti-inflammatory effect. Rutin also exerts antithrombotic action by eliminating free radicals that cause platelet aggregation. Flavonoids have antioxidant activity owing to their redox properties, which can neutralize free radicals. To the best of our knowledge, this is the first study to report the presence of rutin and monomer precursors of condensed tannins (catechin and epicatechin) in D. brasiliensis. In Drimys genus, some flavonoids were detected, but rutin, tannins, and phenolic acids have not been described thus far. These compounds could be responsible for its pharmacological activity. Drimane sesquiterpenes  were isolated from the aerial parts of D. brasiliensis, and polygodial drimane sesquiterpenes, drimanial compounds, 1 β (p methoxy cinnamyl) polygodial, epifuegina, acids, and fatty alcohols were isolated from the bark. Furthermore, the flavonoids, i.e., astilbin, quercitrin, isoastilbin, and neoastilbin were found in D. brasiliensis. Other works describe the volatile compound composition of D. brasiliensis Miers and D. angustifolia Miers. D. brasiliensis extract presented strong antioxidant potential by reducing DPPH radicals. The perceptual reduction, with the higher concentration of the extract (500 μg/mL), reached 63% [Figure 3]a. The potential antioxidant effect of D. brasiliensis extract was converted into Vitamin C (VCEAC), demonstrating the great antioxidant potential of the extract [Figure 3]b. It is well known that volatile oils isolated from D. angustifolia and D. brasiliensis do not present antioxidant activity. However, for the first time, the antioxidant properties of D. brasiliensis bark extract have been described. 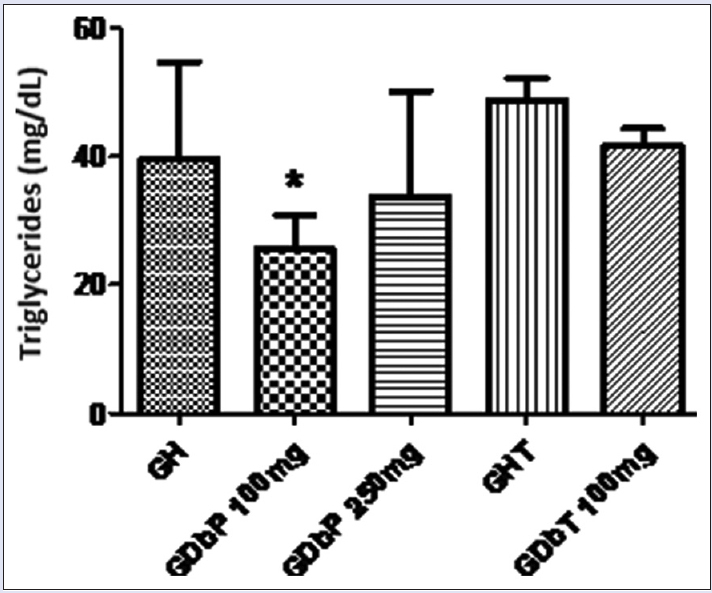 To determine the doses of D. brasiliensis extract for the in vivo study, doses of 250 and 500 mg/kg were initially administered by gavage to rats (6 animals per group). However, the 500 mg/kg dose caused the death of three animals; hence, this dose was reduced to 100 mg/kg. The dose of 500 mg/kg/day orally was defined as the lethal dose (LD50). The doses of 100 and 250 mg/kg/day were used for this study. Clinically, two rats of GDbP 250 had epistaxis, difficulty breathing, and diarrhea. The group treated with 100 mg/kg/day showed no clinical signs of toxicity. No statistically significant differences in the hematological parameters were observed between the groups. The acute toxicity of essential oils of D. brasiliensis leaf at doses of 175, 550, and 1000 mg/kg has been previously assessed. No deaths were observed, but signs of toxicity such as reduced locomotor activity, ptosis, exophthalmoses, urination, diarrhea, salivation, tremors, increased respiratory rate, and squirming were apparent at all doses. 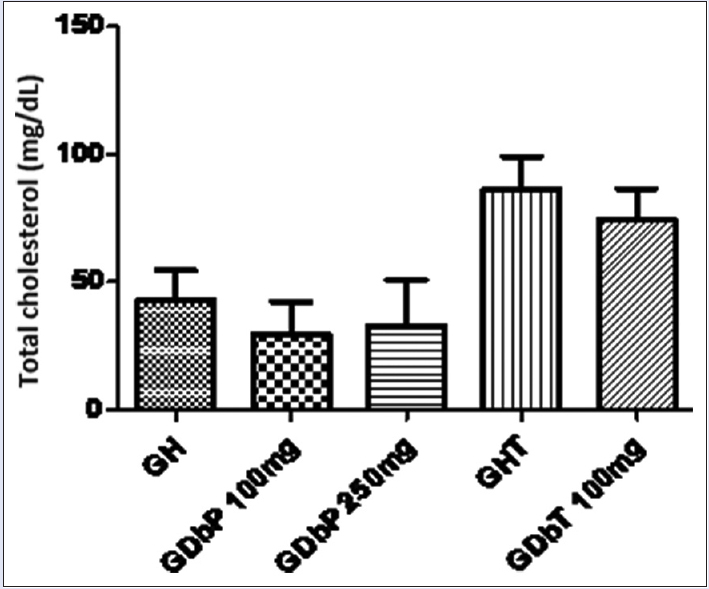 The toxicity of the ethanolic extract of the D. angustifolia bark was investigated, and deaths were observed in the groups treated with 3500 mg/kg (two animals of ten) and 5250 mg/kg (four animals of ten), and a decrease in the spleen and liver weight was observed. No deaths occurred with the leaf extract. The differences between the LD50 values in the different studies can be explained by the differences in the polarity of the extracts. Essential oils present a chemical composition that is rich in lipids with no polar compounds (cyclocolorenone, terpinen-4-ol, and myristicin), whereas we used polar compounds in this study. Hence, D. brasiliensis can be considered more potent than D. angustifolia. Statistical changes in food consumption, relative body weight gain, relative organ masses, and protein levels were not observed in the organs between groups. Interestingly, the plant extract was able to reduce cholesterol [Figure 4] and triglycerides [Figure 5] both in the prevention and treatment assay, with a significant effect observed at a dose of 100 mg/kg/day. In the treatment assay (GDbT 100 mg and GHT), the total cholesterol levels were the highest compared to the prevention assay owing to the fact that these groups received a hypercaloric diet for 40 days while the other groups were fed a hypercaloric diet for 20 days. No significant differences between groups were observed in HDL cholesterol and blood glucose levels. Considering the absence of significant changes in food consumption, which could result in lower hypercaloric intake, and consequently improvement of lipid profile, we speculate that anti-lipid activity is directly related to the antioxidant activity of D. brasiliensis extract as proven using the DPPH test. The antioxidant activity is directly related to the chemical composition of the extract where monomers of condensed tannins, flavonoid, and phenolic acids were detected. A linear relationship was not observed between hypocholesterolemic activity and dose since other unidentified mechanism could be involved. Thus, this is the first study to report that D. brasiliensis extract has the ability to reduce triglycerides and total cholesterol, thereby aiding to control this disease. Other studies have related the presence of phenolic compounds to an improvement in the plasma antioxidant capacity. The diet consisting of Jaffa grapefruit (100 g/kg) for 4 weeks improve the plasma lipid levels and increase the plasma antioxidant activity. Furthermore, the hypocholesterolemic and antioxidant activities of durian, mangosteen, and snake fruit (50 g/kg) in rats were evaluated, and no difference among the tropical fruits was observed. In this way, the dose used in our work is lower than that used in other works, and the results were significant. For the first time, we have proven that D. brasiliensis Miers extract has antioxidant activity and reduces triglycerides in vivo. Mechanisms responsible for this pharmacological effect possibly are related to the scavenging of free radicals as demonstrated in vitro. Doses used can be considered safe since animals did not present any clinical signs of toxicity during treatment. The chemical composition (monomers of condensed tannins, flavonoids, and phenolic acids) was found to be directly related to its antioxidant activity. Consequently, the importance of ethnopharmacology for the development of drugs has once more been proven. D. brasiliensis shows incredible potential to be used as a nutraceutical and to develop new drugs owing to its antioxidant and anti-lipid properties. Gus I, Fischmann A, Medina C. Prevalência dos fatores de risco da doença arterial coronariana no estado do Rio Grande do Sul. Arq Bras Cardiol 2002;78:478-83. Sichieri R, Coitinho DC, Monteiro JB, Coutinho WF. Recomendaçμes de alimentação e nutrição saudável para a população brasileira. Arq Bras Endocrinol Metabol 2000;44:227-32. Botsaris AS. Plants used traditionally to treat malaria in Brazil: The archives of flora medicinal. J Ethnobiol Ethnomed 2007;3:18. Simμes CM, Mentz LA, Schenkel EP, Irgang BE, Stehmann JR. Plantas Da Medicina Popular No Rio Grande Do Sul. 5th ed. Porto Alegre: UFRGS; 1998. Lago JH, Carvalho LA, da Silva FS, de O Toyama D, Fávero OA, Romoff P. Chemical composition and anti-inflammatory evaluation of essential oils from leaves and stem barks from Drimys brasiliensis Miers (Winteraceae). J Braz Chem Soc 2010;21:1760-5. Malheiros A. Estudos químicos, Farmacológicos E Alelopáticos Das Espécies Drimys angustifolia e Drimys brasiliensis (Winteraceae). Florianópolis, SC, Brasil: Thesis, Pós Graduação Em Química, Universidade Federal De Santa Catarina; 2001. Malheiros A, Cechinel Filho V, Schmitt CB, Yunes RA, Escalante A, Svetaz L, et al. Antifungal activity of drimane sesquiterpenes from Drimys brasiliensis using bioassay-guided fractionation. J Pharm Pharm Sci 2005;8:335-9. Mendes FR, Carlini EA. Brazilian plants as possible adaptogens: An ethnopharmacological survey of books edited in Brazil. J Ethnopharmacol 2007;109:493-500. Witaicenis A, Roldão EF, Seito LN, Rocha NP, Di Stasi LC. Pharmacological and toxicological studies of Drimys angustifolia Miers. (Winteraceae). J Ethnopharmacol 2007;111:541-6. Infográficos: Dados Gerais Do Município; 2014. Available from: http://www.ibge.gov.br/home/. [Last cited on 2014 Jun 23]. Parpinelli C. Tupanci do Sul, Ontem E Hoje. 1st ed. Sananduva: 2008. Chini SO. Taninos E Flavonoides Em Lotus Spp. Passo Fundo, RS, Brasil: Master Dissertation, Pós Graduação Em Agronomia E Medicina Veterinária, Universidade De Passo Fundo; 2013. Favaretto A. Aspectos Alelopáticos, Fitoquímicos E Anatômicos Do Capim Annoni 2. Passo Fundo, RS, Brasil: Master Dissertation, Pós Graduação Em Agronomia E Medicina Veterinária, Universidade De Passo Fundo; 2014. Brand-Williams W, Cuvelier ME, Berset C. Use of a free radical method to evaluate antioxidant activity. LWT Food Sci Technol 1995;28:25-30. Kim DO, Lee KW, Lee HJ, Lee CY. Vitamin C equivalent antioxidant capacity (VCEAC) of phenolic phytochemicals. J Agric Food Chem 2002;50:3713-7. Colla LM, Muccillo Baisch AL, Vieira Costa JA. Spirulina platensis effects on the levels of total cholesterol, HDL and triacylglycerols in rabbits fed with a hypercholesterolemic diet. Braz Arch Biol Technol 2008;51:405-11. UE – Union E. Directive 02010/63/EU of the Euroean Parliament and of the Council of 22 September, 2010 on the Protection of Animals Used for Scientific Purposes; 2010. p. 33-79. Available from: http://www.eur-lex.europa.eu/LexUriServ/LexUriServ.do?uri=OJ: L: 2010:276:0033:0079:en: PDF. [Last cited on 2013 Jul 20]. Brasil. Lei No 11.794, De 8 De Outubro De 2008. Regulamenta O Inciso VII Do ç 1o Do Art. 225 Da Constituição Federal, Estabelecendo Procedimentos Para O Uso Científico De Animais; Revoga A Lei N. 6.638, De 8 De Maio De 1979; E Dá Outras Providências; 2008. Available from: http://www.planalto.gov.br/ccivil_03/_ato20072010/2008/lei/l11794.htm. [Last cited on 2009 Nov 10]. SBCAL. Sociedade Brasileira De Ciência Em Animais De Laboratório; 2013. Available from: http://www.cobea.org.br/. [Last cited on 2013 Nov 01]. Cook NC, Samman S. Flavonoids – Chemistry, metabolism, cardioprotective effects, and dietary sources. J Nutr Biochem 1996;7:66-76. Vichnewski W, Kulanthaivel P, Herz W. Drimane derivatives from Drimys brasiliensis. Phytochemistry 1986;25:1476-8. Mecchi MC, Lago JH. Chemical constituents derived from Drimys brasiliensis Miers (Winteraceae). Nat Prod Res 2013;27:1927-9. Limberger RP, Scopel M, Sobral M, Henriques AT. Comparative analysis of volatiles from Drimys brasiliensis and D. angustifolia Miers (Winteraceae) from Southern Brazil. Biochem Syst Ecol 2007;35:130-7. Gomes MR, Schuh RS, Jacques AL, Dorneles GG, Montanha J, Roehe PM, et al. Biological assessment (antiviral and antioxidant) and acute toxicity of essential oils from Drimys angustifolia and D. brasiliensis. Rev Bras Farmacognosia 2013;23:284-90. Gorinstein S, Leontowicz H, Leontowicz M, Drzewiecki J, Jastrzebski Z, Tapia MS, et al. Red star Ruby (Sunrise) and blond qualities of Jaffa grapefruits and their influence on plasma lipid levels and plasma antioxidant activity in rats fed with cholesterol-containing and cholesterol-free diets. Life Sci 2005;77:2384-97. Haruenkit R, Poovarodom S, Leontowicz H, Leontowicz M, Sajewicz M, Kowalska T, et al. Comparative study of health properties and nutritional value of durian, mangosteen, and snake fruit: experiments in vitro and in vivo. J Agric Food Chem 2007;55:5842-9.